What the focus on eating local and/or humane animal products overlooks is the massive inefficiency and waste of resources inherent in cycling plant proteins through animals in order to eat the animals — from whom we obtain only a small fraction of the total available protein and calories when compared to consuming plant foods directly. Consider that even with more than 98% of all farmed animals in the U.S. currently being raised by intensive methods — that is, using very little space and land per animals — still some 44%, or nearly half of all the land in the U.S., is devoted to rangeland, pasture, or other grazing lands. With 95 million cattle, we would need, by the most conservative estimates, 250 million acres to convert all U.S. dairy and beef operations to pastured systems. That’s more than 10% of all the land in the U.S.
And that’s just cows. Nearly all of the nine billion chickens used for meat and eggs in the U.S. are confined indoors. We would need astronomically more land than actually exists to pasture even half of these chickens and the millions of pigs, sheep, goats, and turkeys currently being raised in confinement operations. This chart is reprinted from Meatonomics by Dave Simon. Animal agriculture is a main driver of human-caused climate change. The United Nations has noted that the “livestock sector” is responsible for more greenhouse gas emissions than ALL transportation combined. Yet environmental specialists critique the United Nations reports as conservative and conclude that animal farming is responsible for at least 51 percent of human-caused greenhouse gases. 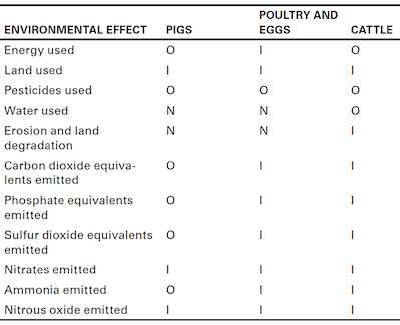 The increased land use necessary to more “humanely” farm animals often results in even higher emissions of harmful GHGs. It’s estimated that grass-fed cows produces up to four times more methane than grain-fed cows. Methane is 25-72x stronger greenhouse gas than carbon dioxide. This is basic biology because of the digestion processes needed to breakdown the fiber in forage. The climate impact is made worse because cows fatten more slowly on grass than on grain, thus pastured cows take significantly longer to reach slaughter weight than feedlot cows, emitting more methane and nitrous-oxide along the way. In general, unconfined animals gain weight more slowly than confined animals because they are allowed more movement. Organically-raised animals grow even more slowly because they aren’t permitted growth-promoting hormones or antibiotics. Most of the energy/calories animals consume is used to fuel their own physiological processes. Beyond that, it takes up to one hundred times more water and eleven times more fossil fuel to produce animal protein than equal amounts of plant protein. Organic cattle require 10 percent less water than inorganic but still need 2.7 million gallons each during their lives, enough to fill 130 residential swimming pools. In light of the orders-of-magnitude difference in water needed to raise plant and animal protein, does a 10 percent savings for organic cattle really matter?